We provide Stober Right-Angle Geared Motors, Stober Axial Geared Motors, Stober AC Geared Motors, Stober Servo Ball Screw Motors, Stober Servo Gear Units and Stober Rack and Pinion Drives. Co-axial geared motor with large shaft-center distance. Particularly suited as travel drive. 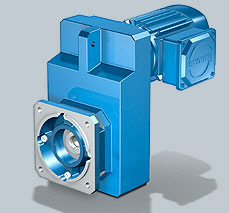 Purchase your Stober MGS F Shaft-Mounted Helical Geared Motor today!